When I received the press release about actress Denise Richards launching the Denise Richards Volume Extend by Cristophe Volumizing Styling Products, a new hair care line that was not only add volume, but was also good for the hair, I admit I was a bit skeptical. However, as I struggle to give my baby-fine hair even the appearance of thickness, I was willing to try it. After having used the product line for a week, I confess I am impressed. I decided to test these products in different combinations: shampoo and conditioner alone; adding the Volumizing Crème; adding the Volumizing Spray; adding the Volumizing Crème or Spray with the Finishing Spray. The first time I used the shampoo, I noticed that my hair felt thicker. Although my hair was not easy to comb out after using the Volumizing Conditioner, it did not weigh down my hair and left it looking full. After using the Volumizing Spray, my hair looked full and thicker all day long. The Volumizing Crème feels thick, and I was concerned it would weigh my hair down and leave it oily. It did not, but left it thick and soft. Then came a long day when I had to go from work to a movie set to a business meeting/ supper. I knew this would be the ultimate test of these products. That morning, after shampooing and conditioning my hair, I used the Volumizing Crème, blew my hair dry and set it with a hefty amount of Finishing Spray. After the Finishing Spray dried, I touched my hair; my hair felt soft and non-sticky as if there was no setting spray on it at all. While on the movie set, a freakish thing happened. A 15 foot whirlwind (think mini-tornado) whisked across the ground and lifted the tent where I was sitting. I, along with three other people in the tent, grabbed a tent pole, and all of us were almost lifted into the air with the tent. The whirlwind knocked over a table and bent the frame of the tent before moving on. After making sure everyone was alright, I went to the ladies room to freshen up. I was stunned when I looked in the mirror. My hair looked as good as if I had just fixed it. I know this sounds like a commercial, but I kid you not. I am not stating that being anti-tornado proof is one of the claims of these products, but it really happened to me. 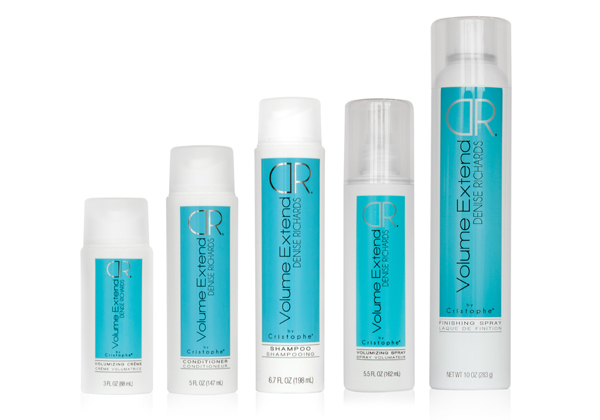 Without a doubt, I am a confirmed fan of Denise Richards Volume Extend by Cristophe Volumizing Styling Products. Denise Richards Volume Extend by Cristophe Volumizing Styling Products can be purchased from Cristophe.com and ShopNBC.